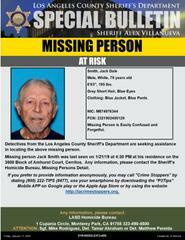 Los Angeles County Sheriff’s Department’s Missing Persons Unit detectives are seeking the public’s assistance in locating Jack Dale Smith. 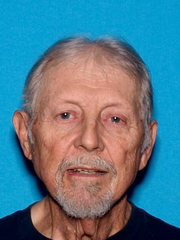 He is a 79 year-old male White who was last seen leaving his residence on the 3800 block of Amhurst Court, Cerritos, on Monday January 25, 2019 at 4:30 p.m.
Mr. Smith is described as 6’3”, 195 lbs., gray short hair, and blue eyes. He was last seen wearing a blue jacket, and blue pants. Mr. Smith is easily confused and forgetful and his friends and family are very concerned for his well-being and asking for the public’s assistance in locating him.